Justice. Grace. Which one is heavier? more important? easier? Which would you choose? I guess that depends on what side of the issue you are on. Jamie Brock is most definitely on the side of justice. The thought of exhibiting grace rarely seriously crosses her mind. And for good reason. Jamie has not been the recipient of much grace, it seems. The man who murdered her mother has still not received his just punishment, and so many others have abused the grace that others have exhibited. For her, it is a matter of integrity. But everything changes as one case after another begins piling up and pieces to puzzles she didn’t understand before start falling into place. So many questions come up, and she is unsure who she can trust and where she should turn. It could end up costing her her life, and the lives of those she loves. What will justice do for her then? 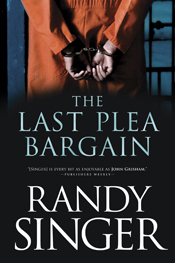 The Last Plea Bargain by Randy Singer is a legal thriller that forces you to think through these questions. I read The Justice Game by Singer last year and really enjoyed it, so I was excited to see this book scheduled to be released this year. Randy’s books have a way of making you think and ask difficult questions. He will not put a proposition before you and expect you to agree with him, and I really appreciate that in an author. I also learn a lot when I read Singer’s books. He is a good author/teacher, and that makes it fun to read books outside of my general area of understanding. Singer has given us a story that is fast-paced and exciting, but also includes a lot of thought-provoking questions. There are a lot of twists and turns to the story, so you are constantly guessing what is going to happen. On a critique side, there were times when I felt that there were maybe too many twists, and I myself never knew who to root for or support. It was not enough to ruin the story, but at the end I was maybe a little disappointed with some of the resolved relationships and exposed secrets. If it were up to me, those things could have stayed secrets, so I could keep liking the characters! This is a novel, there ought to be some suspension of reality in the mind of the reader, so the critiques I have would not cause me to not recommend the book. On the contrary, I would highly recommend this book. Sometimes it is hard to come across good, solid fiction written from a biblical worldview that is not offensive and yet is set in the real world and deals with real world issues. This is one of the few. You won’t regret it, I promise! What are other people saying? Here are a couple other reviews of The Last Plea Bargain to check out!